All vital records that the Missaukee County Clerk has available are listed from the early 1870s to the present. This includes births and deaths, marriages and divorces, naturalization and land records. Military discharge records are available, as well, from 1918, the year World War I ended, to the present. All records, except for birth records from 100 years ago or less, are available and open to up to eight genealogists and researchers at a time at the County Clerk's office. The Clerk website provides request forms which can be mailed in to request copies of records, as well as utilizing LexisNexis Payment Solutions, a system which allows online ordering and purchasing of all available records, including civil, criminal, and others. 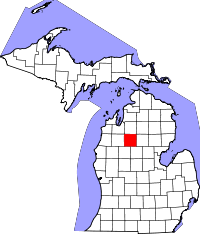 Prior to 1871, the year Missaukee County was founded, the area it is comprised of was part of the much farther north county of Mackinac.